Bulova 1951 Duo Wind "E"
1951 "Selfwinding" bumper. I can't even find any information on this movement. Was this model Bulova's first automatic wrist watch? What is it? Will my watch guy get it running? So many questions. One of the smaller autos to be sure. 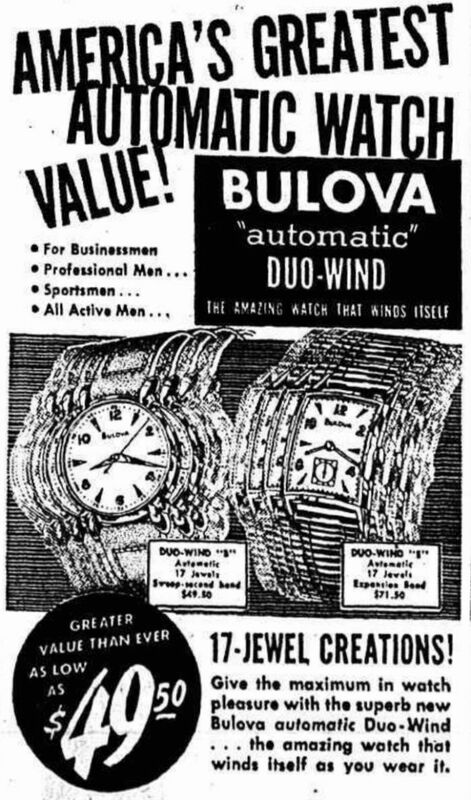 Bulova's foray into automatic winding occurred at the same time most other brands did- in the 1930's, and included Bumpers, Pendule style and Wig-Wag types. In modern times, this technology goes back to the mid-twenties with the famous Harwood watch. Historically, automatic pocket watches date to 1777 (Breguet), although a similar watch was claimed the same year by Perrelet. It's a hotly contested thing, and other names have laid claim, not the least of which was LeRoy. There are still a lot of Bulova parts floating around, but depending what is wrong with it, your watch guy may indeed be able to get it back to running condition. This looks very familiar but so far I haven't found an advert. Great information Reverend. I'm still learning. This looks to be the Duo WInd 'E'. Another example here. Early 50s we see the Duo Wind, but later in the 50s the style shows up in the Ambassador line. There was also a Duo Wind 'D', which had a full numeral dial and strap with the same case. Is there an L# datestamp on the caseback? Another possibility, depending on a datestamp, is that this is post-DuoWind where it acquired an alternate name (think of Duo WInd and Thayer). The pricelists show the Duo Wind E as reference number 973; this same ref # is assigned to a Sherwood model at the same $71.50 price. Also, Crystal GS CMX365-10 is stated to fit the Sherwood and the Duo WInd D (is the case the same for D & E - looks to be). Perhaps without Duo WInd on the dial it could be the Sherwood. An ad would certainly help, but I do not find any Sherwood ads at that price. A couple references for both names possibly being the same watch to consider. It's identical (except for face text) to the watch in the Db Ken linked. Noting possible name change based on year of watch, I await date stamp verification. Except for the dial stamp, it certainly looks like a Duo-Wind "E"
The hands are like the round Duo Wind 'B', but, other than that, it would appear to be a match to the Duo Wind 'E'.